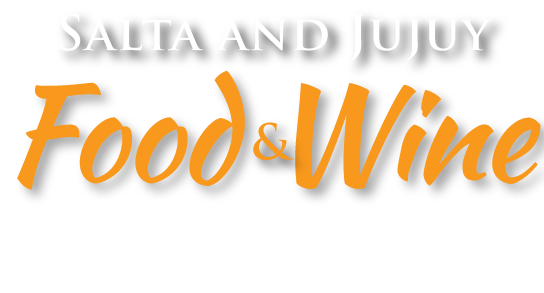 Northwest Argentina offers the world the most delicious popular cuisine dishes, enhanced by the unequalled altitude wines, which have international recognition. It´s cuisine is as rich as its history. From the famous empanadas to the most elaborate dishes. 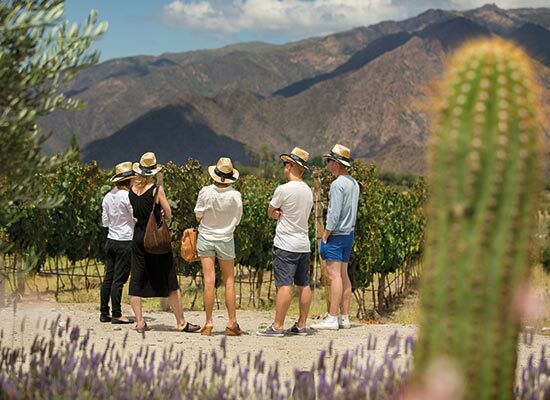 The Calchaquí Valleys are located southwest of Salta and are home to the highest vineyards in the world, some cultivated at more than 3.000 metres above sea level (9.842 feet). Amazing landscapes, colours, historical towns, crafts, archaelogy and typical cuisine add zest to this. Northwest Argentina is an invitation to relish. Come and savour it! 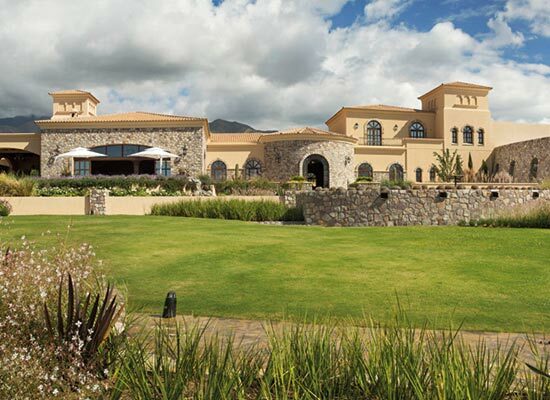 We will meet you at Salta City´s airport and transfer you to your boutique hotel. As an introduction to the region, we will do a guided tour around the city. 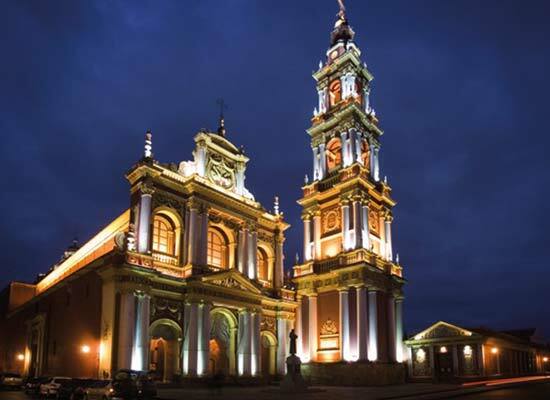 The City of Salta is one of the best preserved in Argentina. Neocolonial houses and churches stand out near the main square like the Cathedral, the Cabildo or Town Hall, San Francisco Church and San Bernardo Convent. The Inca culture was very important in this region. The MAAM (High Mountain Archaeological Museum), is one of the most important museums in Argentina. It was created to preserve the frozen bodies of the Children of the Llullaillaco, three Inca childs found perfectly preserved in 1999, on the summit of the Llullaillaco Volcano at 6.700 metres above sea level (21.981 feet). Their magnificent funerary offerings are also kept with them, as well as diverse objects, tools and crafts distinctive of this ancient civilization. A welcome dinner in a gourmet restaurant. Night in Salta at Villa Vicuña Hotel. We will have breakfast and then leave in the morning. We start our trip driving southwest towards Lerma Valley. We will have lunch in a family farm. This family has rescued traditions and unique objects, and create the first Tobacco Museum in Argentina and an Archaeological Museum of particular importance. They produce tobacco, goat cheese, pepper, aromatic herbs and native trees. They have been awarded by Slow Food International for their delicious food made with the production of their organic orchard, the goat cheeses and the biodiversity conservation. After lunch, we will go through the Quebrada de las Conchas Natural Reserve. It is also known as the Gorge of the Shells due to the amount of marine fossils it contains. This road has a particular geography that has been carved by wind and rain. Surprising rock formations seen in gorges and multicoloured mountains surprised the traveler. Some of these formations are the Garganta del Diablo or Devil´s Throat, The Amphitheatre and the Castles. Visit to the Vine and Wine Museum. Dinner in the hotel, at it´s unique restaurante. Night in Patios de Cafayate, a wine hotel. 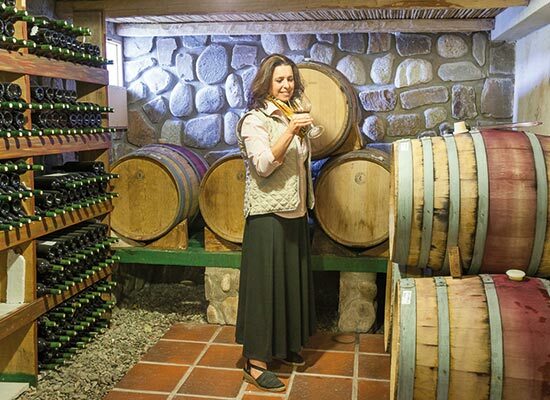 We will have breakfast and then visit Bodega El Esteco, located in the hotel Patios de Cafayate. French immigrants David and Salvador Michel founded the winery in 1892, and it soon became one the pioneering establishments in the art of Argentine winemaking. Blessed by the assets of the region and the dedication of its staff, it has since then earned well-deserved recognition for the high quality of its products. 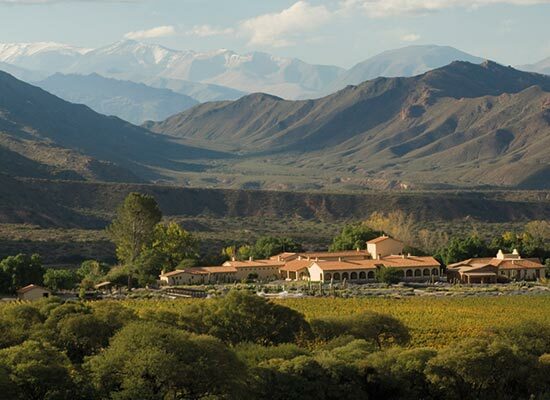 Cafayate is an unique and excellent grape-growing region in the world. Then we will visit Bodega Piattelli, situated amongst breathtaking ancient red rock formations and mountains in the Calchaquí Valleys. This winery sits at 1.768 metres aove sea level (5.800 feet). We will visit the winery, taste high altitude wines and have lunch with an incredible view. After lunch, we will start our tour to Quilmes, to visit the ruins. The Ruins of Quilmes is an archaeological site in the Calchaquí Valleys. The site was the largest pre-Columbian settlement in the country, occupying about 30 hectares. It is believed that about 5.000 people lived there. Although discovered in 1888, were first studied in 1897 by the archaeologist Juan Bautista Ambrosetti. Dinner in Cafayate Wine Resort. Night in Patios de Cafayate. Early in the morning we will start our drive along the famous Route 40. This route stretches all the way south to Patagonia and is one of the longest routes in the world. We will drive towards Quebrada de las Flechas (Canyon of the Arrows). This landscape has between 15 and 20 million years. Narrow steps are formed with walls of 20 metres height in both sides of the route. It´s one of the most incredible landscapes across the Calchaquí Valley. We will have lunch in Hostería de Molinos. After lunch, we will go to Estancia Colomé. Founded in 1831, Bodega Colomé is one of the oldest wineries in Argentina. Located in the Upper Calchaquí Valleys, home to the world’s highest vineyards, sitting between 2.300 and 3.111 meters above sea level (7.545 – 10.206 feet). The breathtaking views and the vast expanses of untouched terrain make Colomé one of the jewels in the crown of Hess Family Estates, a family-run business made up of 7 wineries across the world. We will visit the winery, taste high altitude wines and have a delicious dinner prepared by a local chef. He seeks perfect combinations between the different dishes and the wines. Night in Estancia Colomé. There has always been a close relationship between wine and art. Both imply the participation and combination of natural factors, an artist is involved in both their processes of creation and production, both stimulate our senses and give us pleasure. In Colomé, this bond becomes even closer because Donald Hess, its founder, is a renowned collector and patron of the arts as well as a worldwide wine producer. The James Turrell Museum at Bodega Colomé is part of the Hess Art Collection around the world and it is exclusively dedicated to the work of this famous artist. James Turell is best known all over the world for his work with light. Later, you can enjoy many different activities such as horseriding, hiking, mountain bike, swimming and tennis. We will have lunch and dinner in Colomé. The flavours of Colomé can be tasted in the wines produced in the Winery and in the unique dishes. Most ingredients come from the vegetable garden, where they use agroecological practices to get products that are beyond organic and have natural flavours and textures. 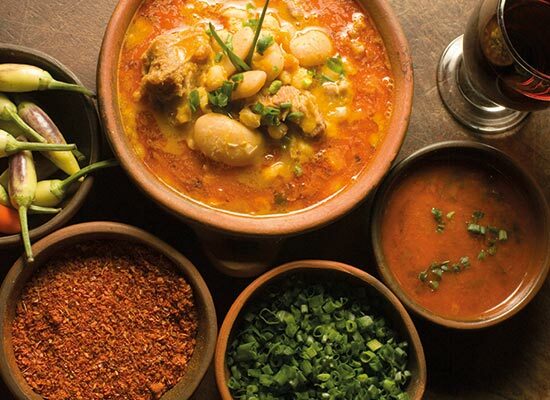 Both Andean and regional-cuisine dishes stand out because of their blend of exquisite tastes. Night in Estancia Colomé. We will drive through the Route 40 towards Cachi. Up ahead, we will see the highest snowed mountain in the Calchaqui Valley, Nevado de Cachi with 6.380 metres above sea level (20.931 feet). At its feet, is located Cachi surrounded by coloured mountains and blessed by the Calchaqui River. Cachi remains a quiet and colonial town with a beautiful square. We will have lunch in the Sala de Payogasta, a hotel with a small winery. Then we will go through Los Cardones National Park, a preserved area with cardones (huge cactus plant). Finally, we will drive downhill along Cuesta del Obispo, the maximum height being at the Piedra del Molino lookout (3.348 metres above sea level). Dinner in a typical restaurant will give you the chance to listen to locals playing the guitar. Night in Salta at Villa Vicuña Hotel. 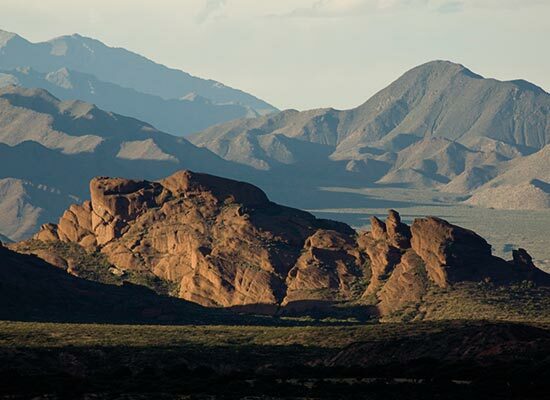 We will go driving from the hotel to La Caldera, located 22 kms away from the City of Salta, through the route 9. An 18 metre high image of a Christ protects the village and its church. This day we will go through an incredible cloud forest, a splendid scenario for bird watching. 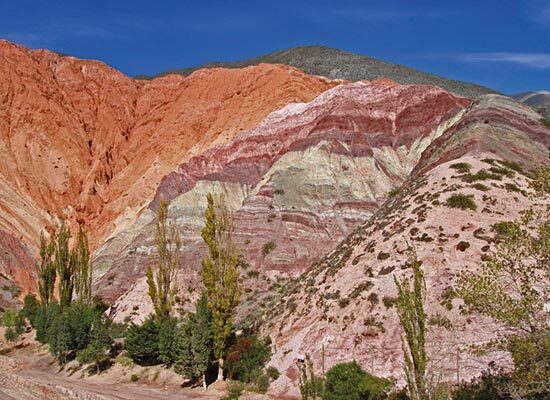 Today we will appreciate completely different landscapes, from the green jungle to the multicoloured mountain of The Quebrada de Humahuaca in Jujuy province. In 2003 it was declared a UNESCO heritage site. There are a lot of small towns along The Quebrada de Humahuaca: Maimara, Purmamarca, Tilcara, Uquía and finally Humahuaca. There is an archaeological site in Tilcara, The Pucará. Uquia shows in it church old paitings from Cuzco, Perú. Purmamarca, is a small town known by its Seven Colour Mountain, where we will spend the night. We will visit the square, the church and the artisan market. Dinner in the hotel. Night in Purmamarca at El Manantial del Silencio. In our last day, we will drive from Purmamarca up to the highest point in Cuesta del Lipan 4.170 metres above sea level (13.681 feet). 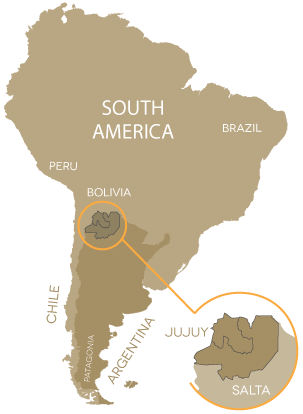 This is an international route that goes to Chile and Bolivia. At this point, we descend to Salinas Grandes. Salinas Grandes is one of the biggest Salt flats in Argentina. 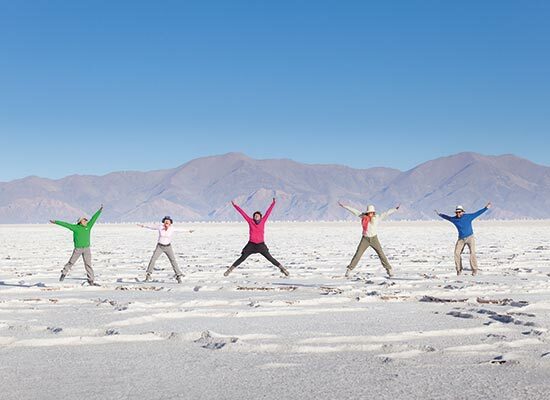 It is located in the limit of Salta and Jujuy provinces, at more than 3.000 metres above sea level (9.842 feet). With an area of 212 km2, this enormous “white sea” of salt is one of the breathtaking landscapes in Argentina. We will be able to discover this breathtaking place walking at a slow pace because of the altitude. Dinner in the town. Night in Purmamarca at El Manantial del Silencio. Breakfast at the hotel. Transfer from Purmarca to Salta City ´s airport. End of our services.